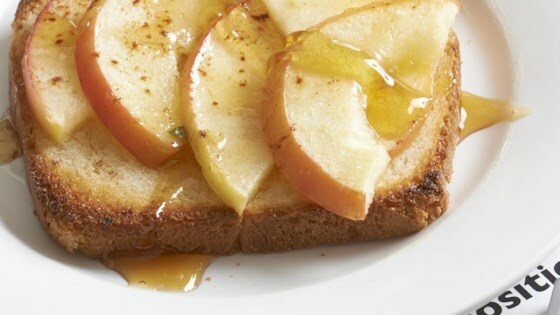 "Apple toast is a great after-school snack for kids who are picky eaters. It doesn't take long to make and is a light snack that will leave you satisfied." Spread butter on one side of each slice of bread. Place apple slices on buttered side of bread. Sprinkle cinnamon on top. Place bread on a baking sheet. Place in a preheated oven until toasted, about 2 minutes. This was not good; it was soggy until I first toasted the bread. Then the kids enjoyed it. I tried this last night and LOVED it! I toasted the bread first and that helped it to not get too soggy. I used WAY less than a tbsp of cinnamon for four slices of toast. This is delicious as is, but is even better with a drizzle of honey or even a little brown sugar. Thanks! We substituted peanut butter for the butter - my 7 yr. old loved this.